Here is another of the several wood-boring beetle species that I encountered during my June trips to the sandstone glade complex near Calico Rock in north-central Arkansas. Shortleaf pines (Pinus echinata), the only native pine in this region, are common on and around the glades due to their acidic soils, and this mating pair of Buprestis lineata (family Buprestidae) was found near the base of the trunk of one of the larger trees. These were actually the first of a number of different wood-boring beetles that I found on this particular tree, others being Xylotrechus sagittatus, Chalcophora virginiensis, and the sumptuously beautiful Acanthocinus nodosus. All of these species are classic pine-associates in the southeastern U.S. After photographing this couple, I observed numerous other individuals flying to the tree, landing on its trunk and searching nervously for mates, then fleeing if I approached too close (except the unfortunate early few that I conscripted as ‘vouchers’). The tree was a veritable singles bar for wood-boring beetles! Despite their abundance in the area, the pines do not grow well on the glades due to the thinness of the soils (that is, where there is soil!). 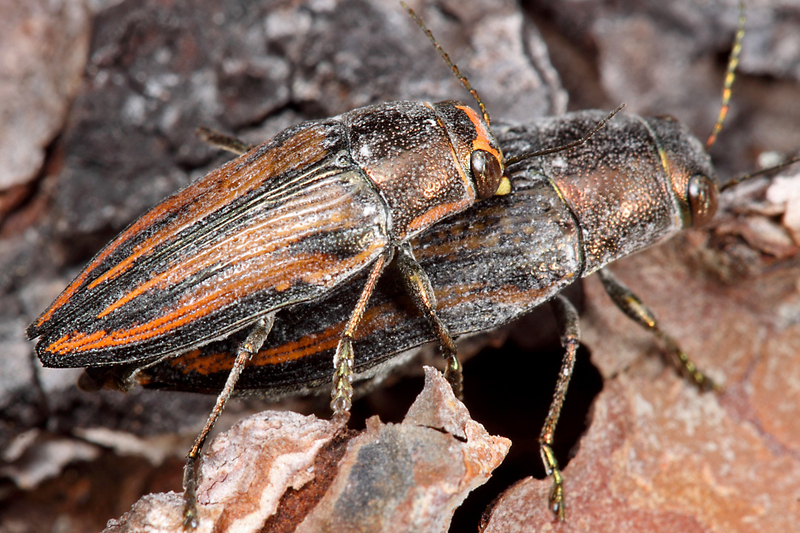 Not only do the trees grow slowly, but they suffer reduced longevity and high turnover, producing an abundance of stressed and dying trees that wood-boring beetles in the families Buprestidae and Cerambycidae are only too happy to utilize. Most species in these families (with notable exceptions such as the emerald ash borer, Agrilus planipennis) prefer dead or dying trees for larval development, largely because healthy trees are quite capable of fending off attacks by bleeding and overwhelming newly hatched larvae as they attempt to bore into the tree. Adults are able to detect these stressed trees through chemoreception of host plant volatiles, thus, the presence of numerous wood boring beetle adults on an otherwise healthy-looking tree is a clue that the tree’s days are numbered. I don’t know what it was about the tree that caught my attention and made me go over to take a look at it—perhaps just its large size, but it proved to be a fruitful detour. This entry was posted in Buprestidae, Coleoptera and tagged Arkansas, beetles, entomology, insects, jewel beetles, nature, science. Bookmark the permalink.